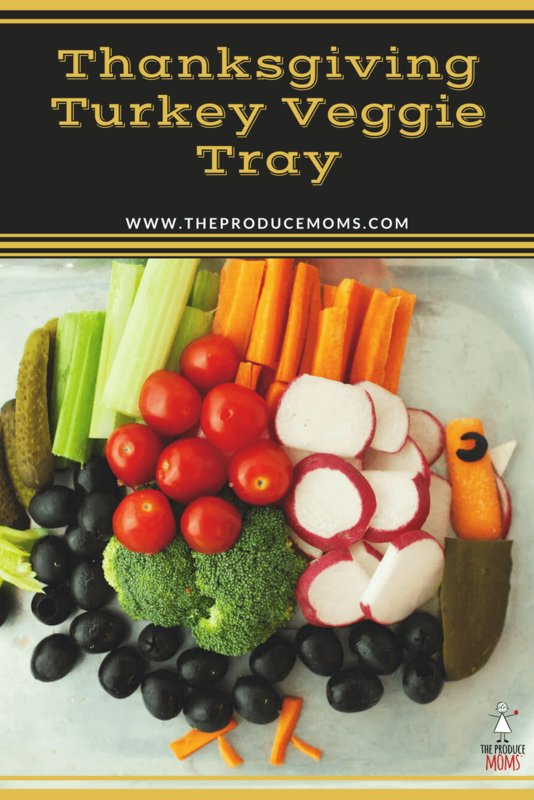 Delight your family with an adorable Thanksgiving Veggie Tray! This Thanksgiving, add color and a festive spirit to your table with a fun turkey veggie tray! Not only does this Thanksgiving veggie tray look great, it incorporates a variety of vegetables that everyone can enjoy. To assemble this vegetable tray, start by placing a handful of sliced radishes in the middle of your tray. Then set down the broccoli florets and grape tomatoes. Stack a few of the tomatoes on top of the florets to give the turkey a layered, almost 3-D effect. Place black olives all around the bottom of the turkey’s body. Be sure to make him nice and plump! Use a combination of pickles, celery, and carrot sticks to make the feathers. Use a few celery greens to create the tailfeathers. Thinly slice a carrot stick for the feet. Next, it’s time to bring your turkey to life by creating his cute little face! To do so, start by cutting a pickle in half. Use this to create a neck. Then, place a small carrot above the pickle. To create the turkey’s eye, thinly slice an olive. Cut a small triangle from a radish to create the beak. Finally, step back and admire your work! In the middle of the a serving platter, place a handful of sliced radishes. Behind the radishes, place the grape tomatoes with the broccoli florets under the tomatoes (see image). Place black olives along the bottom of the turkey's body (tomatoes/broccoli/radishes). Use celery greens as a tail for the turkey. Use pieces of a carrot stick as the feet. Use a small carrot and half a pickle slice to make the head/face of the turkey. The eye can be made by a very thin slice of a black olive. Use a small piece of the white portion of the radish to make a beak. If you have a large family, simply use a larger tray and more veggies to create a larger turkey. It would also be darling to make two turkeys facing each other on the same tray. Don’t be afraid to add more or different kinds of veggies, either. Any way you make it, your veggie turkey is sure to be a hit with the entire family!